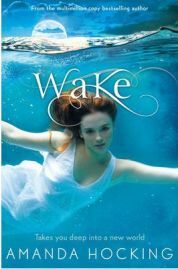 Wake is the first novel in Amanda Hocking’s latest series, Watersong. Since I discovered Hocking’s wonderful My Blood Approves series and her Trylle trilogy, she has signed with a publisher, meaning her novels are available in print as well as in Kindle ebook format. I assumed that her writing would be as enjoyable as ever, but there was a thought in the back of my mind wondering whether Wake would measure up to her earlier novels. Hocking’s stories tend to be about fantasy characters set in our world, and Wake is no different. Gemma and Harper are sisters living in the small seaside town of Capri, and among the summer tourists are some unsettling visitors, a trio of beautiful and captivating girls, Penn, Lexi and Thea. There have been disappearances in the local area, and while no-one seems to quite trust the girls, they are seen only as unwanted visitors. Then Gemma wakes up after a night on the beach with the girls, and she realises that she has changed. Wake is a fairly typical set-up for a fantasy series such as this. Life is carrying on as normal, until one character becomes involved with the strangers, and then things begin to change, leading to the climax of the novel. Gemma, Harper and the other characters we meet in Capri are all likeable and sympathetic; while Harper may come across as a bit of a control freak, Hocking makes sure we understand her motivations and doesn’t present her as irritating. Gemma is a sweet girl, totally focused on swimming and her dream of making the Olympics, but sadly that is what draws Penn’s attention to her. In order to avoid spoilers, I won’t give away what the supernatural element of Wake is, but suffice to say that Hocking has hit on something which is fresh and different. You won’t find any vampires or werewolves on the pages of Wake, or even any of the angel-like characters which have popped up in various forms in other novels. The fantasy side of Wake draws on Greek mythology, and Wake is the first novel I’ve read featuring this type of character. Although I wouldn’t like to state that it is unique or a first, it’s certainly likely that most readers won’t have read about these characters before. Hocking’s writing style is as enjoyable as ever. She has what you could describe as a casual style, never too heavy or wordy, yet well written and striking exactly the right tone for this type of story. Her main characters are in their late teens, but we are not subjected to lots of teen-speak. While there may be the odd pop-culture reference, this fits in perfectly in the setting. Wake is a bit of a slow-burner, seeming to take a while to get going, but the set-up is enjoyable and keeps you turning the pages, as the tension builds. She may be a published author now, but Amanda Hocking hasn’t lost her ability to create enjoyable and gripping stories populated by great characters.